Welcome Dubrovnik, commonly known as “the pearl of the Adriatic Sea”. You will be met at the airport and transferred to your private yacht, where a warm welcome awaits you from your captain and crew. Dubrovnik’s old town’s charm lies on its white limestone streets, baroque buildings and ancient city walls that protected a civilized, sophisticated republic for centuries. A UNESCO World Heritage-listed site, is on the menu today. 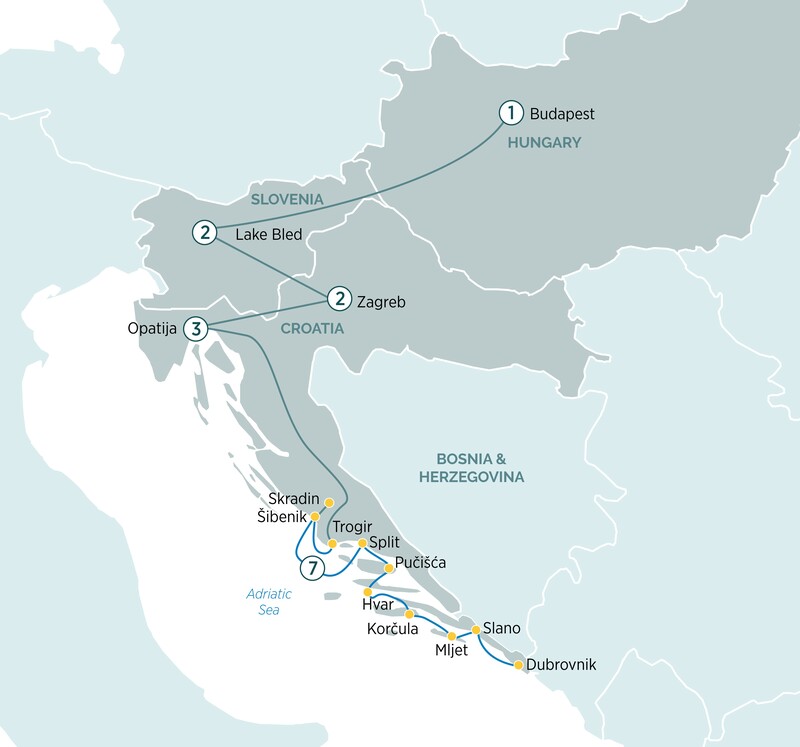 After the tour, cruise to Slano, and reach the peninsula's wine empire, Ston is a jewel in Adriatic Coast. You will have an included tour of Ston followed by a wine tasting session. Today, you’ll sail towards Hvar. With its beautiful fields of lavender and carefully cultivated vineyards, the island is considered to be one of the most beautiful islands in the world. Carpeting the hillsides around its cosy harbour are terracotta-roofed villas, Gothic palaces and 13th-century ramparts rising towards an impressive citadel. During your included guided tour, visit the impressive bell towers of the Franciscan Monastery, St Mark’s Church and Cathedral of St Stephen. Pucišca, a settlement in the middle part of the northern part of the island Brac. The town is known for having a special variety of stones, of which have been used to build part of the “White House” in Washington DC. For many generations, locals have been making use the stone and as part of your EmeraldPLUS, you will have a change to visit a stonemason-school. Founded in 1909 the school provides educational support for local students, producing quality religious icons, fountains, statues. After the tour, return to your ship for an afternoon of sailing towards Split, the second largest city in Croatia and the largest city on the Adriatic coast. The city has some fantastic sights with both Roman and modern architecture. Enjoy a guided walking tour through the many facades of this beautiful city. Your day begins with a guided tour of one of the oldest towns on the Adriatic Cost, Šibenik. This charming town boasts fantastic sights which exist from Venetian times. In particular the marble Cathedral of St. James, a UNESCO World Heritage-listed site. The rest of the day is free to enjoy this beautiful town. Named after the Krka River, the Krka National Park covers an area of just over 142 square km and includes two thirds of the river itself. The top attraction of the Park are its magnificent waterfalls, including the famous Skradinski Buk falls which are one of Croatia’s most famous sights. Later, cruise to Trogir, a town designated as a UNESCO World Heritage-listed site in 1997. Trogir is home to a number of fascinating historic sights and rich architecture. This morning, arrive in ancient Zagreb for a two-night stay. Here you will join your local guide for a walking tour showcasing the highlights of the city. Today is yours to spend exploring independently. With Zagreb’s historic centre on your doorstep, your tour director will be available to fulfil your curiosity. Alternatively, join a guided tour of Romanesque Trakošcan Castle. Continuing your journey, you will cross into Slovenia and discover its capital beautiful Ljubljana on a guided tour. Included is a two-night stay in Bled. Start your day with a relaxing boat ride to the island in the middle of Lake Bled, passing striking landmarks like the medieval Bled Castle along the way. In the afternoon continue to baroque town of Radovljica for your farewell dinner with your fellow travellers. Today, drive to the Croatian countryside and cross the border into Hungary. Included is an overnight stay in Budapest. After breakfast, transfer to the airport for your onward or homebound flight.